By Caroline Zaw-Mon, Risk Project Manager, University of Denver, and Glenn Klinksiek, Knowledge Center Content Manager, URMIA. URMIA surveyed its members in July 2015 to find out whether members use e-Leaning orientation materials for their international travelers. Conceptually, e-Learning materials could provide pre-trip online orientation materials and training for travelers. An objective of e-Learning programs would be to generate wider participation than in-person orientations, especially outside of formal study abroad programs. About a quarter of respondents have evaluated e-Learning; of those, two-thirds implemented a program. In general, e-Learning programs are voluntary and cover the range of international travel issues. Whether or not participants have evaluated e-Learning, they acknowledge the potential benefits. About a quarter of the survey respondents said that their institution evaluated e-Learning for international travelers. About two-thirds of those considering e-Learning implemented a program. 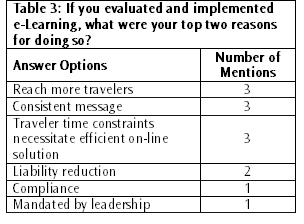 Of those that did not implement an e-Learning program, three cited cost as the barrier while also mentioning that there was no practical way to reach international travelers before their trip. One respondent said they will implement e-Learning next year based on the content of their current face-to-face training. The 10 universities that implemented e-Learning did not have a common reason for doing so. Institutions did want to efficiently reach more travelers with a consistent message. 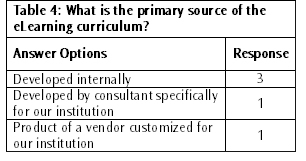 Of the six that responded, three developed the e-Learning internally. The one vendor’s name given was United Educators; the authors are aware that International SOS also provides this training. Six responding institutions offered the training to faculty, students, staff and other university travelers but did not require it. Two institutions did require the training. The six responding institutions with e-Learning programs tended to cover the range of travel issues. Respondents reported that e-Learning training takes one to two hours. Four of the six were satisfied with the e-Learning program and four indicated their program was effective. Some said it was too early to have an opinion about satisfaction or effectiveness. E-Learning would be great as we have a difficult time arranging face-to-face training for all travel. Some travel events are very small, and we do not have the people resources to do individual training on safety travel practices. I would be interested in knowing if there are videos that can be purchased; I can put them on my Blackboard site. I think this is great idea. I believe International SOS has such a system and offers it to their customers - for a fee. We have an in house e-learning module for students about to leave on the "year abroad" component of their degrees but not for other travelers. I think e-Learning for international travel is a terrific tool - in a "toolbox" along with a variety of other methods for communicating with travelers. We are working toward better solutions and offerings, and this is one of those. Very interested in this. We have seen presentations on the subject but have yet to commit due to budget limitations. We are not yet tracking international travel other than study abroad, thus have not evolved to the level of e-Learning. The international programs office feels in person training is more effective. Their personnel do in person training. We will be reviewing platforms for e-Learning materials for pre-departure workshops for students. We do not currently have an e-solution but are interested in either an in-house or third party option. I think it's a wonderful option, not only for student travelers, but for program leaders. That way we ensure consistency and adequacy in training. A bonus would be to track completion. This would be a great asset to travelers. If you know of any programs I would be interested. We are deep in process improvement discussions to build international resources, and we expect e-training to be part of that discussion. Good idea, but have not created a course for our LMS. Interested; would like more information; sounds like a great idea.